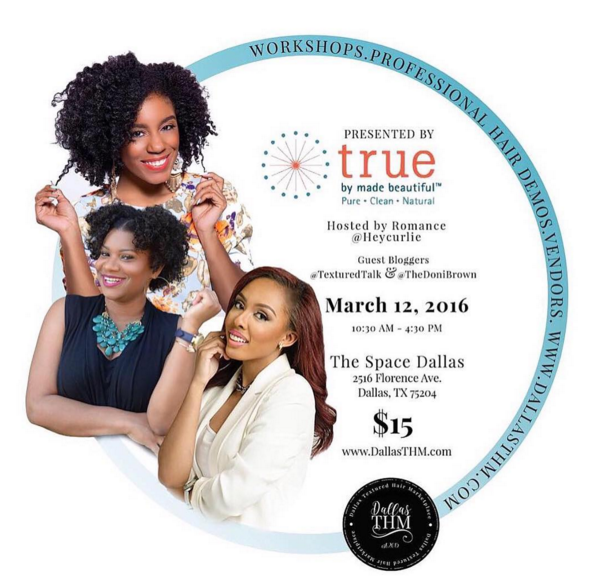 Each month in the heart of D-Town, The Dallas Textured Hair Marketplace will offer three workshops to provide solutions for your hair care challenges led by industry veterans. Join us on Saturday March 12, 2016 in Deep Ellum to meet the brand and the people behind the brand, Made Beautiful. Shop their products along with other hair care and body care vendors, bloggers, textured hairstylist with complimentary workshops from 10:30 AM – 4:30 PM. Swag bag sponsors: True By Made Beautiful, EDEN BodyWorks, Creme of Nature, Sally Beauty Supply, Aunt Jackie’s Curls & Coils and more. To make the marketplace a true one of a kind monthly event, there will also be fun raffle giveaways, opportunities for you to network with industry professionals that are on the horizon, and mingle with fellow naturalistas that are living and thriving in the Dallas area. Come out and join me along with amazing bloggers and creatives in the textured hair community such as @ayeciara, @jaleesacharisse, @iknowleee and many more. There will be amazing workshops hosted by @thenaturalcole and brand amabassador, @thekglifestyle! I am hanging out at the Uncle Funkys Daughter’s Booth and will be chatting about my favorite products and crazy signature alone so grab a ticket and head on out this weekend.VIP Sold Out but General Admission still available! Come out to Dallas Textures Marketplace 1st February event with our title sponsor, Uncle Funky’s Daughter. Get your tickets now at www.dallasthm.com to RSVP .